Cream the butter using a wooden spoon or spatula. Gradually add the sugar until incorporated. Add in the vanilla extract and vanilla bean seeds, then beat until fluffy. Gradually beat in the rice flour and all purpose flour, until the mixture becomes too stiff to work with a spoon. Kneed onto a floured cutting board (or counter top), drawing in flour until dough begins to crack. Form the dough into a ball and let sit for 30 minutes. Roll the dough out onto a lightly floured surface until it is 1/4 inch thick. 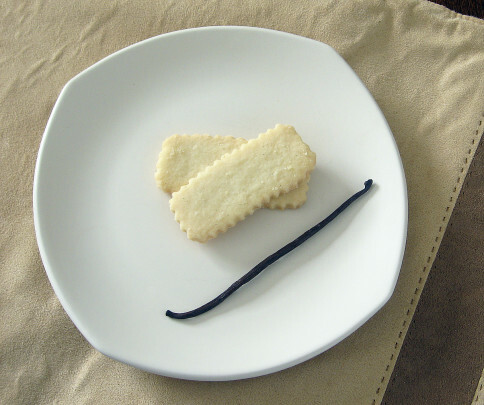 Use your favorite cookie cutter (or the rim of a glass) to cut out your cookies, and place them onto an ungreased baking sheets. Bake for 15-18 minutes or until golden brown. Let cool for 5 minutes on the baking sheet, and then move them to a cooling rack. Makes 30 cookies. Add a little lemon zest and tsp lemon juice and only half a vanilla bean to give them a citrus kick! Grind up almonds in your coffee grinder (about 1/4 cup) and replace 1/4 cup of the flour with the ground almonds. Add 1 tsp of almond extract in place of the vanilla extract. They are extra thick and great for coffee dunking! 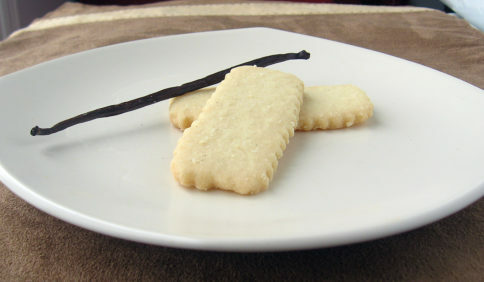 Shortbread is my all time favourite. It’s just so good any time. Simple and yummy! I’m sure all the other shortbreads are jealous. RE: “Great for coffee dunking”- I’ll bring the coffee!!! These look great!